Below is the text of the Federal law regarding motorcycle helmets, including performance requirements. Make sure that when buying a helmet, it is rated to comply with these minimum standards. Not only must you be legally compliant but, more importantly, you want your helmet to protect you in case of a motorcycle accident! This standard establishes minimum performance requirements for helmets designed for use by motorcyclists and other motor vehicle users. The purpose of this standard is to reduce deaths and injuries to motorcyclists and other motor vehicle users resulting from head impacts. This standard applies to all helmets designed for use by motorcyclists and other motor vehicle users. Each helmet shall meet the requirements of S5.1, S5.2, and S5.3 when subjected to any conditioning procedure specified in S6.4, and tested in accordance with S7.1, S7.2, and S7.3. S5.2 – Penetration. When a penetration test is conducted in accordance with S7.2, the striker shall not contact the surface of the test headform. 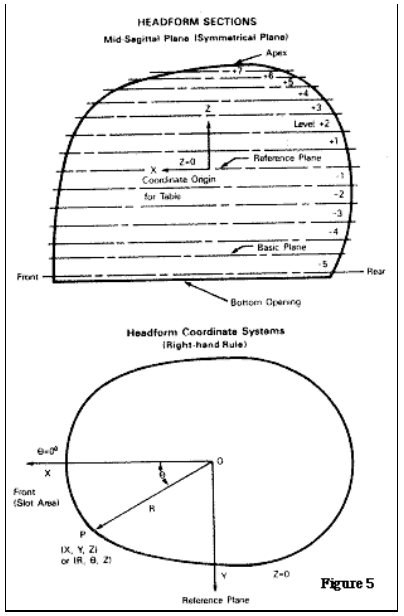 S5.4 Configuration: Each helmet shall have a protective surface of continuous contour at all points on or above the test line described in S6.2.3. The helmet shall provide peripheral vision clearance of at least 105 degrees to each side of the mid-sagittal plane, when the helmet is adjusted as specified in S6.3. The vertex of these angles, shown in Figure 3, shall be at the point on the anterior surface of the reference headform at the intersection of the mid-sagittal and basic planes. 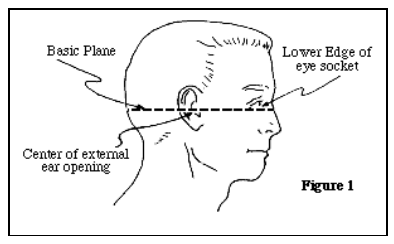 The brow opening of the helmet shall be at least 1 inch (2.5 cm) above all points in the basic plane that are within the angles of peripheral vision (Figure 3). S5.5 Projections: A helmet shall not have any rigid projections inside its shell. Rigid projections outside any helmet’s shell shall be limited to those required for operation of essential accessories, and shall not protrude more than 0.20 inch (5 mm). (a) Manufacturer’s name or identification. (d) Month and year of manufacture. This may be spelled out (for example, June 1988), or expressed in numerals (for example, 6/88). (e) The symbol DOT, constituting the manufacturer’s certification that the helmet conforms to the applicable Federal motor vehicle safety standards. This symbol shall appear on the outer surface, in a color that contrasts with the background, in letters at least 3/8 inch (1 cm) high, centered laterally with the horizontal centerline of the symbol located a minimum of 1 1/8 inches (2.9 cm) and a maximum of 1 3/8 inches (3.5 cm) from the bottom edge of the posterior portion of the helmet. (1) ‘Shell and liner constructed of (identify type(s) of materials). (2) ‘Helmet can be seriously damaged by some common substances without damage being visible to the user. Apply only the following: (Recommended cleaning agents, paints, adhesives, etc., as appropriate). Before subjecting a helmet to the testing sequence specified in S7., prepare it according to the procedures in S6.1, S6.2, and S6.3. S6.1.1 A helmet with a manufacturer’s designated discrete size or size range which does not exceed 6 3/4 (European size: 54) is tested on the small headform. A helmet with a manufacturer’s designated discrete size or size range which exceeds 6 3/4, but does not exceed 7 1/2 (European size: 60) is tested on the medium headform. 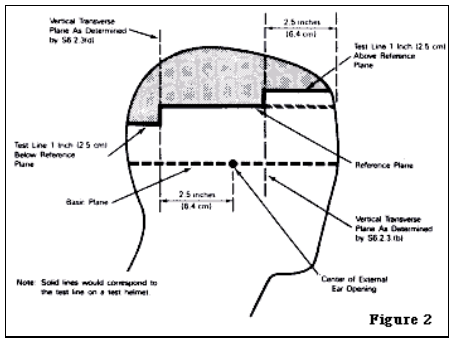 A helmet with a manufacturer’s designated discrete size or size range which exceeds 7 1/2 is tested on the large headform. S6.1.2 A helmet with a manufacturer’s designated size range which includes sizes falling into two or all three size ranges described in S6.1.1 is tested on each headform specified for each size range. S6.2.2 Apply a 10-pound (4.5 kg) static verticle load through the helmet’s apex. 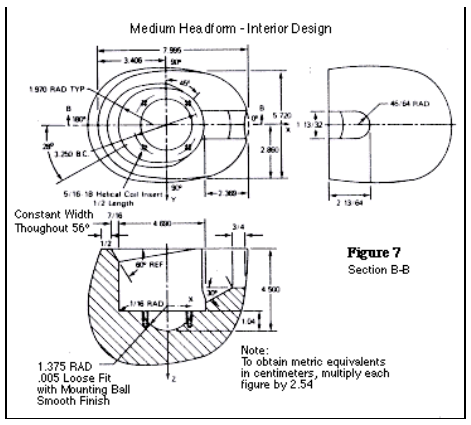 Center the helmet laterally and seat it firmly on the reference headform according to its helmet positioning index. (a) Ambient conditions. Expose to a temperature of 70 degrees F(21 degrees C) and a relative humidity of 50 percent for 12 hours. (b) Low temperature. Expose to a temperature of 14 degrees F(-10 degrees C) for 12 hours. (c) High temperature. Expose to a temperature of 122 degrees F(50 degrees C) for 12 hours. (d) Water immersion. Immerse in water at a temperature of 77 degrees F(25 degrees C) for 12 hours. S7.1.2 Each helmet is impacted at four sites with two successive identical impacts at each site. Two of these sites are impacted upon a flat steel anvil and two upon a hemispherical steel anvil as specified in S7.1.10 and S7.1.11. The impact sites are at any point on the area above the test line described in paragraph S6.2.3, and separated by a distance not less than one-sixth of the maximum circumference of the helmet in the test area. 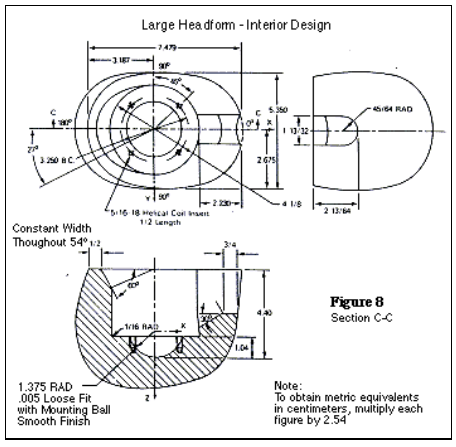 S7.1.4 (a) The guided free fall drop height for the helmet and test headform combination onto the hemispherical anvil shall be such that the minimum impact speed is 17.1 feet/second (5.2 m/sec). The minimum drop height is 54.5 inches (138.4 cm). The drop height is adjusted upward from the minimum to the extent necessary to compensate for friction losses. 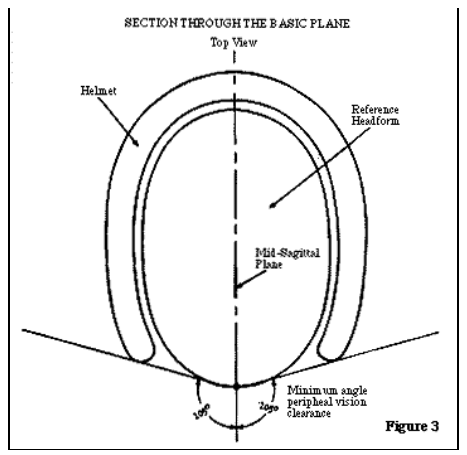 (b) The guided free fall drop height for the helmet and test headform combination onto the flat anvil shall be such that the minimum impact speed is 19.7 ft./sec (6.0 m/sec). The minimum drop height is 72 inches (182.9 cm). The drop height is adjusted upward from the minimum to the extent necessary to compensate for friction losses. 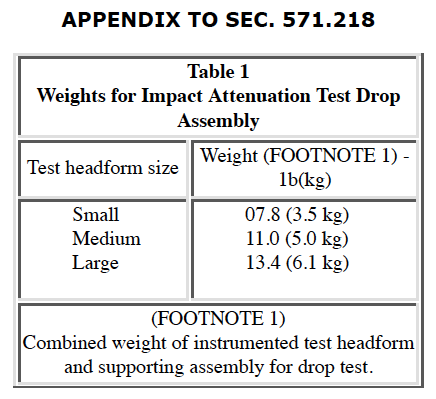 S7.1.7 The weight of the drop assembly, as specified in Table 1, is the combined weight of the test headform and the supporting assembly for the drop test. The weight of the supporting assembly is not less than 2.0 lbs. and not more than 2.4 lbs. (0.9 to 1.1 kg). The supporting assembly weight for the monorail system is the drop assembly weight minus the combined weight of the test headform, the headform’s clamp down ring, and its tie down screws. 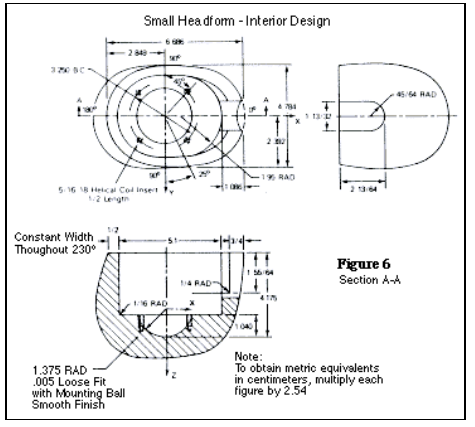 S7.1.8 The center of gravity of the test headform is located at the center of the mounting ball on the supporting assembly and lies within a cone with its axis vertical and forming a 10 degrees included angle with the vertex at the point of impact. The center of gravity of the drop assembly lies within the rectangular volume bounded by x = -0.25 inch (-0.64 cm), x = 0.85 inch (2.16 cm), y = 0.25 inch (0.64 cm), and y = -0.25 inch (-0.64 cm) with the origin located at the center of gravity of the test headform. The rectangular volume has no boundary along the z-axis. The x-y-z axes are mutually perpendicular and have positive or negative designations in accordance with the right-hand rule (Figure 5). The origin of the coordinate axes also is located at the center of the mounting ball on the supporting assembly (See Figure 6, Figure 7, and Figure 8). The x-y-z axes of the test headform assembly on a monorail drop test equipment are oriented as follows: From the origin, the x-axis is horizontal with its positive direction going toward and passing through the vertical centerline of the monorail. The positive z-axis is downward. The y-axis also is horizontal and its direction can be decided by the z- and x-axes, using the right-hand rule. S7.1.9 The acceleration transducer is mounted at the center of gravity of the test headform with the sensitive axis aligned to within 5 degrees of vertical when the test headform assembly is in the impact position. The acceleration data channel complies with SAE Recommended Practice J211 JUN 80, Instrumentation for Impact Tests, requirements for channel class 1,000. S7.1.11 The rigid mount for both of the anvils consists of a solid mass of at least 300 pounds (136.1 kg), the outer surface of which consists of a steel plate with minimum thickness of 1 inch (2.5 cm) and minimum surface area of 1 ft (FOOTNOTE 2) (929 cm (FOOTNOTE 2) ). S7.2.4 The height of the guided free fall is 118.1 inches (3 m), as measured from the striker point to the impact point on the outer surface of the test helmet. S7.2.6 The weight of the penetration striker is 6 pounds, 10 ounces (3 kg). S7.2.7 The point of the striker has an included angle of 60 degrees , a cone height of 1.5 inches (3.8 cm), a tip radius of 0.02 inch (standard 0.5 millimeter radius) and a minimum hardness of 60 Rockwell, C-scale. 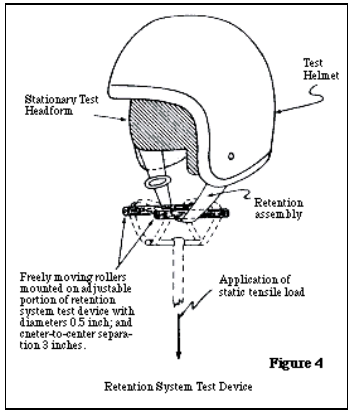 S7.3.2 The retention system test device consists of both an adjustable loading mechanism by which a static tensile load is applied to the helmet retention assembly and a means for holding the test headform and helmet stationary. The retention assembly is fastened around two freely moving rollers, both of which have a 0.5 inch (1.3 cm) diameter and a 3-inch (7.6 cm) center-to-center separation, and which are mounted on the adjustable portion of the tensile loading device (Figure 4). The helmet is fixed on the test headform as necessary to ensure that it does not move during the application of the test loads to the retention assembly. S7.3.3 A 50-pound (22.7 kg) preliminary test load is applied to the retention assembly, normal to the basic plane of the test headform and symmetrical with respect to the center of the retention assembly for 30 seconds, and the maximum distance from the extremity of the adjustable portion of the retention system test device to the apex of the helmet is measured. S7.3.4 An additional 250-pound (113.4 kg) test load is applied to the retention assembly, in the same manner and at the same location as described in S7.3.3, for 120 seconds, and the maximum distance from the extremity of the adjustable portion of the retention system test device to the apex of the helmet is measured.